ARBITRARINESS: 10% of Counties Account for All Recent Death Sentences in the U.S.
A recent article in Second Class Justice, a weblog dedicated to addressing unfairness and discrimination in the criminal justice system, highlighted that the death penalty continues to be arbitrarily applied in the United States. Citing figures from the American Judicature Society, author Robert Smith revealed that only 10% of U.S. counties accounted for all of the death sentences imposed between 2004 and 2009, and only 5% of the counties accounted for all death sentences between 2007 and 2009. 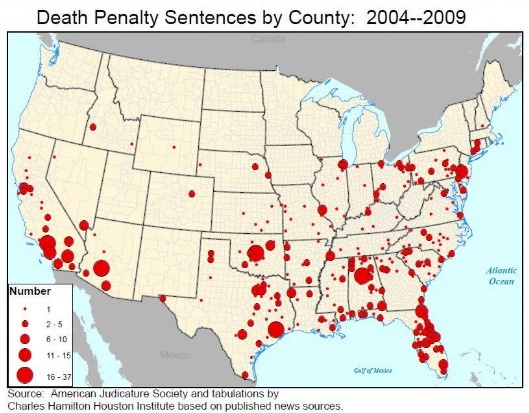 Even in states that frequently impose the death penalty (such as Texas, Alabama, Florida, California and Oklahoma), only a few counties produce the state’s death sentences. According to the article, “The murders committed in those counties are no more heinous than murders committed in other counties, nor are the offenders in those counties more incorrigible than those who commit crimes in other counties. Examination of prosecutorial practices demonstrate that some prosecutors seek death in cases in their jurisdictions while other prosecutors in the rest of the state do not seek death for the same – or even more aggravated – murders.” The article contains a series of slides illustrating the geographical disparities of the death penalty. (R. Smith, "As arbitrary as ever," Second Class Justice, October 17, 2010). Robert Smith is counsel for the Harvard Law School’s Charles Hamilton Houston Institute for Race andJustice. See Arbitrariness and Sentencing.